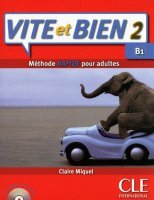 Vite et Bien is a two level program designed for adults impatient to communicate successfully in French! The vocabulary is simple and varied, so as to tackle effectively in all situations of daily life and work. Book, audio CD and key are included. Each volume covers in twenty units, 100 to 120 hours of class time. Each unit consists of two pages with illustrated reading passages, cd listening activities vocabulary, civilization and a grammar lesson. There are also three pages of communication, vocabulary and grammar exercises followed by the answer key page where listening, reading, speaking and writing responses are assessed. The students will acquire a basic grammar and vocabulary, and feel comfortable in oral and written communication. Students will also gain cultural knowledge of life in France, learn the language of daily life, be able to understand newspaper articles, literary excerpts and be able to discuss everyday activities.